TL;DR: Our recent survey of over 3,000 consumers explored the type of content and channels that best attracts people’s time and attention. The clear winner is video, with interactive articles and social content emerging as close contenders. 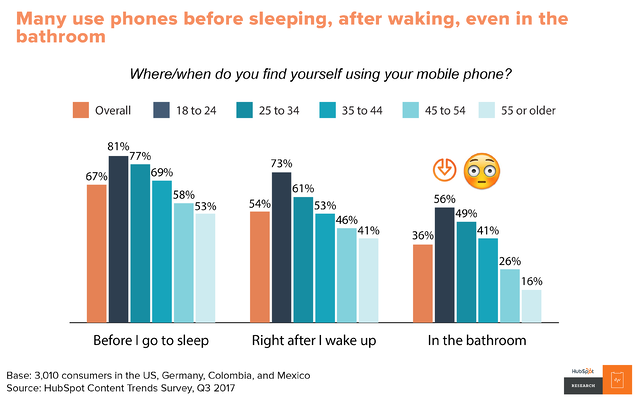 Mobile phones are an integral part of modern life, with many admitting they use their phones before they sleep, after they wake up, and even in the bathroom throughout the day. MilWhen It Comes to Content, Age Matters. A Lot. In July, Google announced it’s overhauling its mobile homepage to feature content based on past searches. Why the change? Google is adapting to the way people discover products and trends. 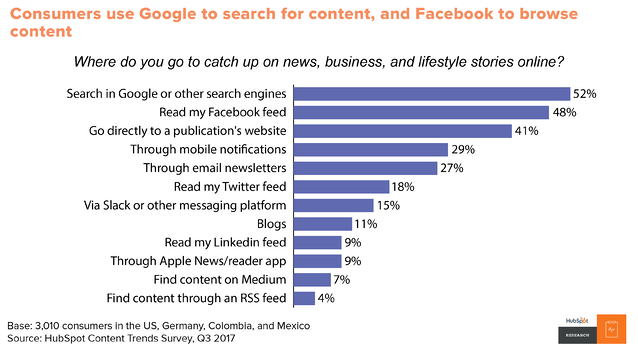 Many still rely on Google to find content, but Facebook is now nearly as influential as Google. As more consumers passively discover content through their Facebook feed, Google is attempting to compete by encouraging mobile Google users to browse suggested content through their feeds rather than actively search. 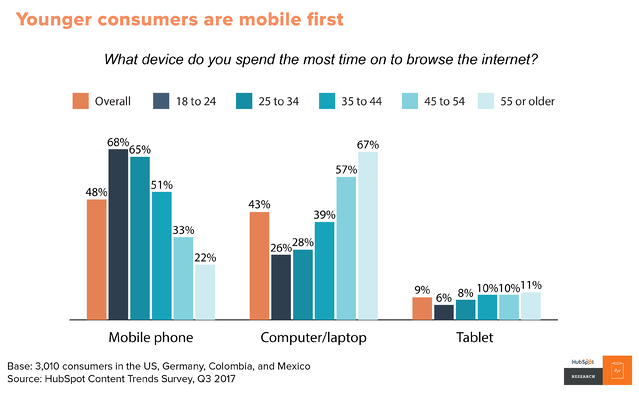 Google is shifting their mobile experience to cater to younger consumers, who are mobile first internet users. Millennials now favor Facebook almost as highly as Google as a source for content. 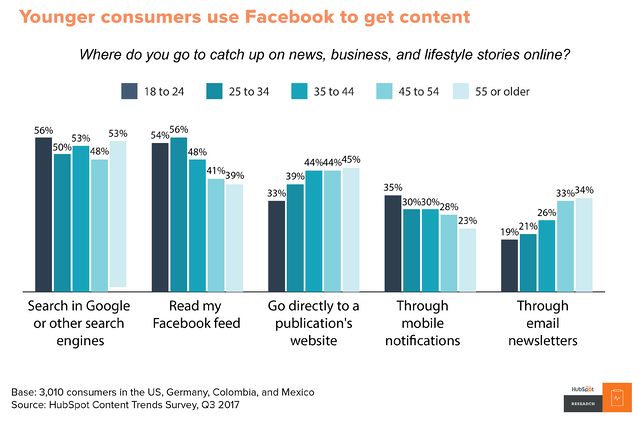 In contrast, Gen X and Boomer consumers have a stronger preference for going directly to a news site or receiving email content. What does this mean for marketers? SEO will continue expanding to new channels beyond search engines. SEO Marketers will now need to contend with search algorithms on Amazon or YouTube in addition to Google or Bing. With the ubiquity of Facebook, marketers will have to suffer the whims of Facebook's algorithms in order to get discovered. Additionally, the type of 'enticing' content that needs to be developed for channels such as Facebook is very different from that for Google. It needs to be worth viewing to capture the attention of someone scrolling down a news feed. As a result, Facebook’s goal to become an all video platform means their algorithm will favor and boost visual formatting in the future. This year, many industry influencers have either bemoaned or advocated for a ‘pivot to video’. 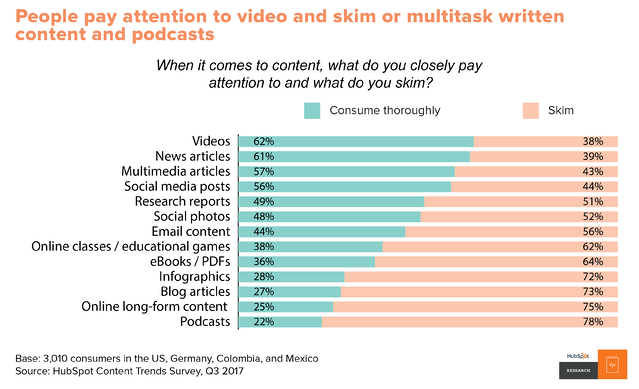 Publishers such as Mic, MTV, and even Newsweek are increasingly shifting their resources to produce more video content while downsizing teams focused on written content. These changes, and resultant layoffs, sting. As with any major change, many within the content industry are debating the merits of focusing on video. Some say it’s a trendy blip, while others argue it’s an inevitable change caused by new consumer preferences. Our data strongly reinforces the latter argument. Video content is very much in demand, for a couple of reasons. First, our respondents tell us they’re more likely to pay attention to video content, followed by news articles and in-depth multimedia articles. As long as the content is timely and engaging, people will focus and pay attention to both video and text-based content. There is a clear indication that people tend to skim most written and audio content. If you want someone’s full attention, video is a great bet. 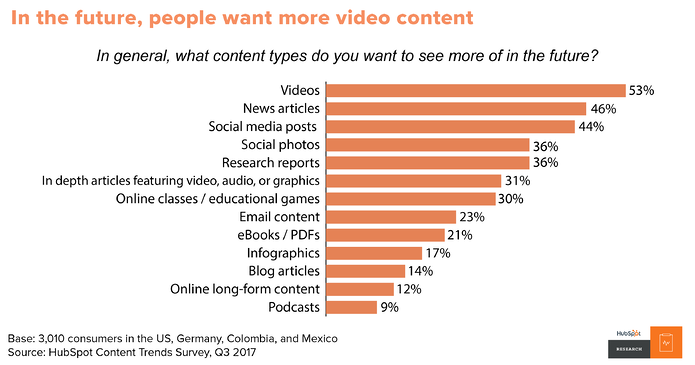 Second, not only do consumers pay attention to video content the most, they want to see more video content in the future (see chart below). Consumer preference for video is real, whether you’re on board or not. But does that mean all content teams need to abandon written content? Not exactly; there is still an audience that wants more written content in the future. Different content preferences clearly reveal themselves when we cut our data by age (see chart below). Millennial respondents show the strongest preference for video and social content. In contrast, Gen X and Boomers prefer more news articles, research reports, and email content, meaning most traditional content teams still have interested readers. Want this chart? Click to download. The key is to balance content teams with the right ratio of traditional written content creators to video-based and social content creators. That ratio depends on the target audience of a brand or media site. Those who cater to millennials will need to increase video investment, while those who target boomers should maintain their standard email and ebook-based content and experiment with video to gauge their audience’s demand. Just keep in mind, millennials are aging, and just because your audience didn’t like video two years ago, doesn’t mean they won’t be interested in it today. Why is video so popular with consumers? 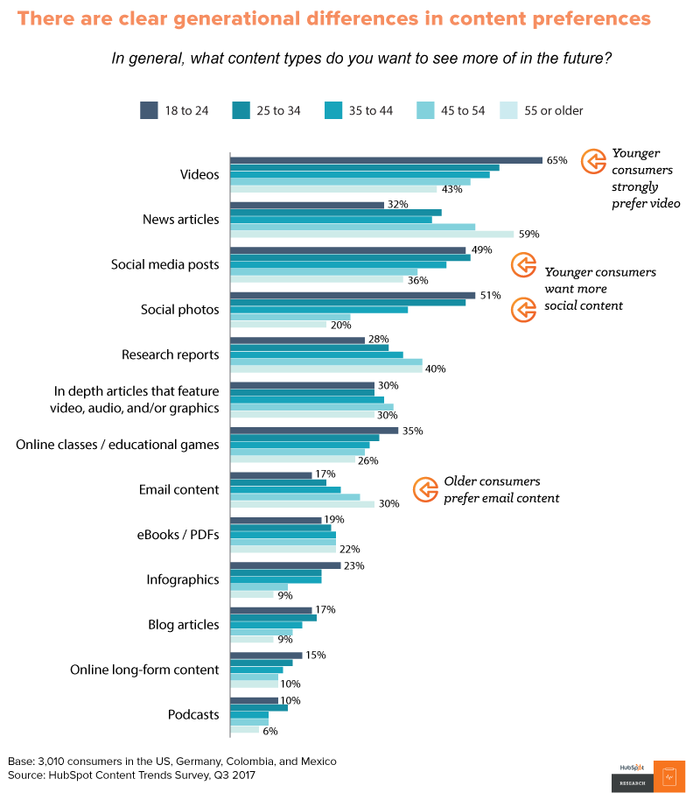 Video content stands out the most, especially for younger consumers. Perhaps it’s because few brands do video content well today, and consumers are more easily impressed. Right now when it comes to video, most brands are working blind because quality is so subjective and difficult to measure. Regardless, video content is consistently favored by consumers. The demand is there. Admittedly, the barrier to entry for video is high: It's more expensive, it often means you're creating less content. But but across every age group, it's the most memorable content. Investing in video content today will feel like what blogging was 10 years ago. Video offers a blue ocean in terms of attention and content options. There's plenty of opportunity for those who choose invest and do it right. Additionally, branded video is nearly 3X more popular than branded blogs or ebooks. 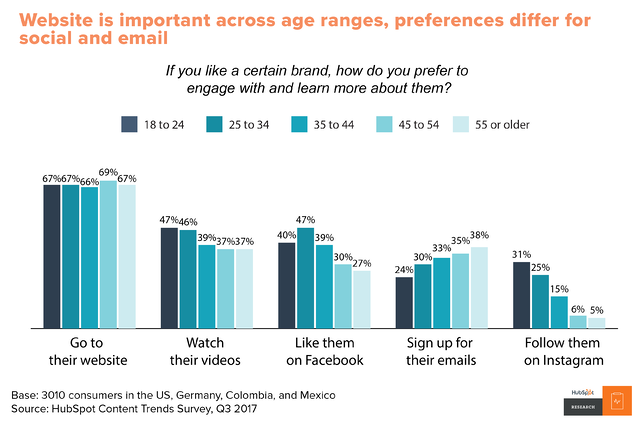 Though email is still a strong brand play today, different generational content preferences will eventually cause a shift away from email to video and social based content. 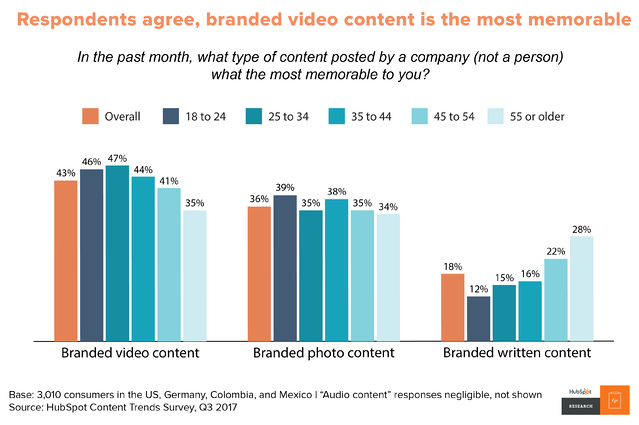 When we cut the data above by age, we found consumers across age groups consistently wanted more branded video content. But there were stark differences for other types of content. Just 22% of young consumers want emails from brands, compared to 68% of Boomers. Inversely, 60% half of younger respondents want to see social images from brands, compared to just 20% of boomers. The decline of email may be due to the fact that for mobile-first millennials, when presented with a constant barrage of phone notifications (texts from friends and family, social media notifications, news notifications, and so on), an email notification is much easier to ignore. 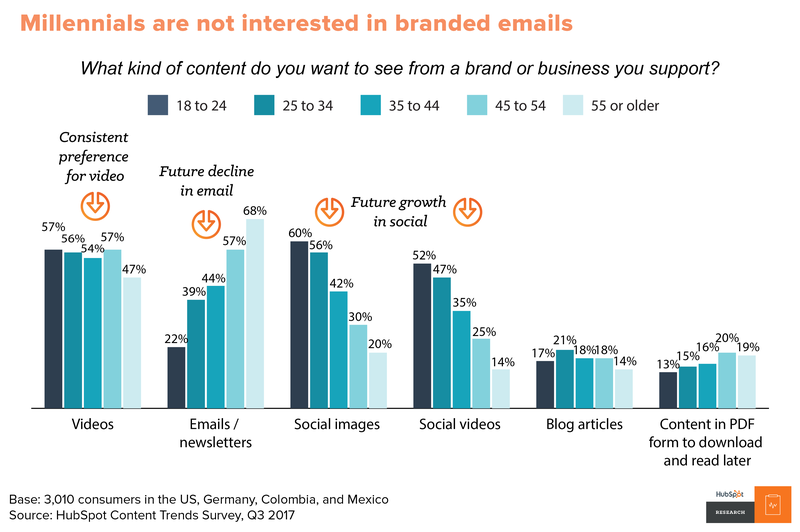 As content continues to get delivered in more visual and engaging ways, it’s understandable that static emails can’t capture millennials’ attention. The ‘death of email’ has long been predicted in the marketing industry, but our demographic data shows that it may actually happen in the near future. Regardless of a brand’s target audience, marketers should prepare for the eventual decline of email as a top source of leads or new business. If we look to the future beyond video, as Gen Z and millennials increase their earning power, we expect brands to also focus on engagement on social social media. 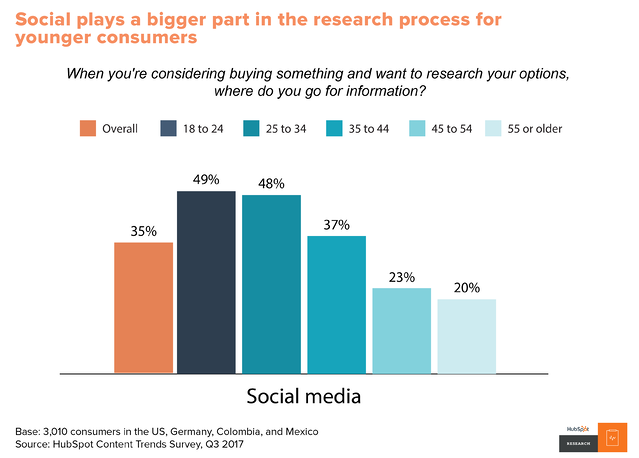 Not only do younger consumers prefer to see more social media content, they use social media as a channel for product research as well. Younger consumers consistently shows the greatest preference for social and treats it as a valid research channel. The age of your customer should play a major role in how you shape your content strategy. As a result, marketers must provide informative content on social media to help consumers better understand their offerings. That means extending from useful written content to video and image-based content. Do Invest In a Mix of Channels and Content. Don’t Ditch Any Specific Channels Today. 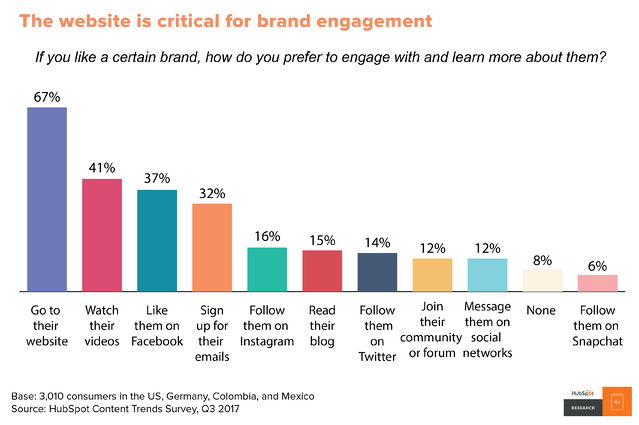 Consumers’ changing preferences does not mean that brands should abandon email, blogs and other written content, or their website today. These content assets are still valuable, especially since there’s a broad range of content preferences amongst consumers in the current state. In fact, when we ask about what people do to proactively learn more about a brand, the top channel is still the brand’s website, across all age ranges. While offsite platforms such as social media are critical to gaining consumer awareness of a brand, when someone is ready to learn more, the company website is still an important source of information. However, while the website will continue to be critical in the future, echoes of our earlier data show up when we review the data by age. Once again, we see higher propensity of younger consumers to seek videos and like a brand on Facebook or Instagram. Older consumers are once again more likely to want email content. As much as marketers might wish they could make their buyer preferences hold still why they catch up, this isn't the case. Even as a marketing team shifts to accommodate millennial preference for video content, know that in another 5 to 10 years, they're going to see a new generation of buyers that looks to social media, or a channel that currently doesn’t exist, as a useful channel for discovery. In the near term, we have to accept that the hype around video is real. People want more video content. 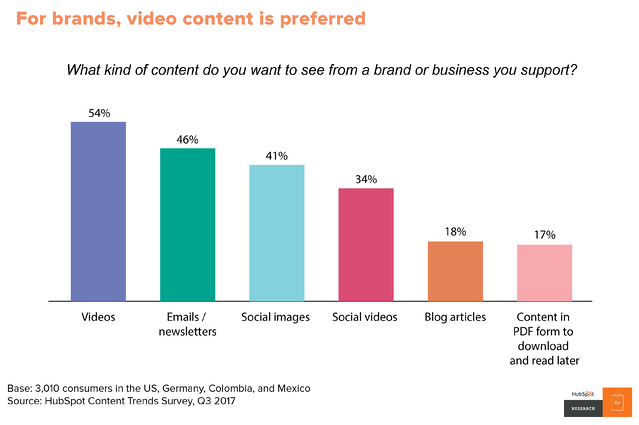 Throughout this report, we’ve seen an especially strong and consistent preference for video and social-based content by millennials. Brands and media companies will need to staff video content creators to cater to their preferences and adjust their goals accordingly, without completely abandoning tried and true tactics that have generated success in the past. Jami Oetting, HubSpot's Content Strategy Manager, puts HubSpot's approach to video this way: Video is "about different KPIs and ways of measuring [success]. It's also important to think about how video is used throughout the funnel. Video isn't just a TOFU (top of the funnel) tactic. It can be effective for sales, customer onboarding, driving loyalty, etc. So learning how to measure video's influence and how to create effective video is key. It's also a challenge from a skill perspective for teams." Recent news has highlighted difficulties media organizations have experienced as they pivot to video. Difficulties are to be expected when trying new channels and content types. But as more content teams change their focus, experimentation and tolerance for lower KPI numbers are necessary. Long held metrics will need to change -- after all, why should businesses measure video views against pageviews? Those who experiment early, learn fast, and recover from ‘failures’ will be best positioned to tap into a growing number of video watchers.